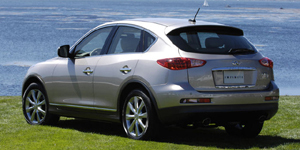 The Infiniti EX35 offers a pleasant driving experience and sporty looks to go with useful cargo space. Add in a powerful engine, a classy interior, and some cool tech features and the EX35 is another fine alternative to clunky SUVs and boring station wagons. For 2010, the headlights of the Infiniti EX35 have been subtly reshaped and there have been changes to features and option packaging. Find the used Infiniti EX35 of your choice from a dealer in your area. Search our used car listings now.